Our two-person team was tasked with developing an interactive educational product for children using the Lego Mindstorms kit. We chose 8- to 10-year-olds as our target population since at this age, children are growing more independent from their parents and take on increasing responsibilities at home and at school. 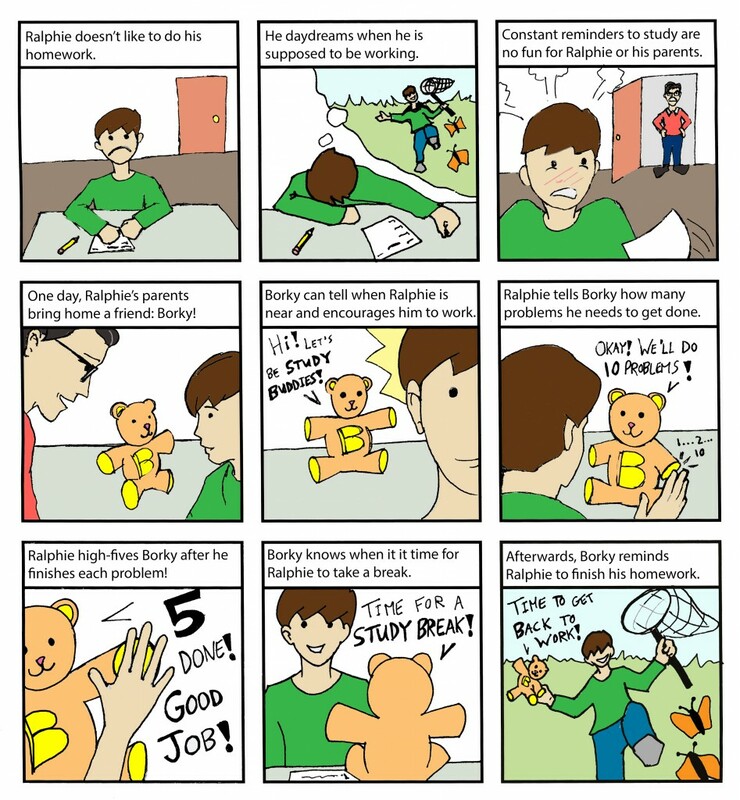 The aim of our product is to help teach children good study skills and improve their productivity by creating a ‘friend’ to remind them to study and keep them on track. For our initial concept I drew (pencil; pen; Photoshop) and co-wrote the storyboard and helped develop the idea with my teammate. In this design, we named the study buddy character “Borky” (‘Bear’ + ‘Work’). Click the storyboard below to see it at full size. Borky keeps kids company. When the child is nearby, Borky detects their proximity via ultrasonic sensor and encourages them to get to work (and stay there). Borky keeps kids on-task. Borky knows what needs to be done as well as current progress. The child inputs the number of problems they want to accomplish during a study session using the touch sensor, and, once incremented, high-fives Borky’s touch sensor once they finish each problem. Borky keeps kids sane. Good work habits also include incorporating breaks, and Borky keeps track of how long the child has been working using a timer and has them take breaks together at regular intervals. Borky is kind of a homebody. Borky uses a magnetic sensor with a ‘home base’ at the child’s workspace, and can tell when it is no longer ‘docked.’ After the break is over, Borky encourages the child to bring it back to its dock to finish their work. Feedback from classmates suggested a more age-appropriate type of character — the teddy bear was seen as too young for the 8-10 range — as well as a different name. 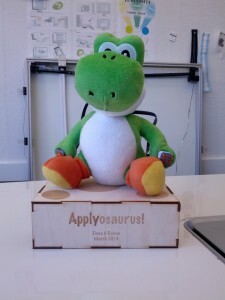 We chose a dinosaur instead to better appeal to this age range and named it “Applyosaurus” to make the character sound fun and entertaining as well as emphasizing how the product teaches the importance of applying oneself to get results. 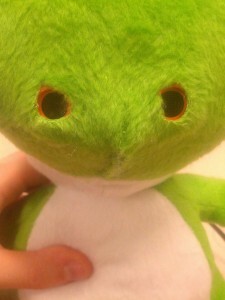 Due to time constraints, we purchased a plush of Yoshi (of Nintendo fame) rather than making an original character. We wanted the character to be small and portable, but the Lego Mindstorms sensors and brick (computer which loads programs and controls sensors) are large and bulky. Given the space constraints, I worked with existing seams and features to integrate the technological components in an appropriate and aesthetically pleasing design. Since I did the programming and my partner did most of the fabrication for Horse, we decided to switch roles for this project. I was responsible for designing and fabricating the project, while my partner programmed Applyosaurus to be as smart as it is good-looking. 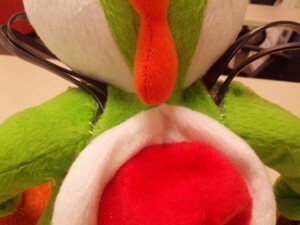 Fit the ultrasonic sensor in the snout? Challenge accepted! 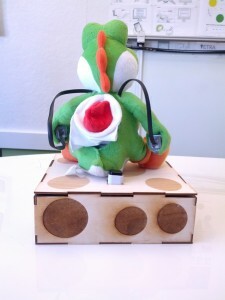 Components: Yoshi plush with integrated Lego brick, ultrasonic/proximity sensor, touch sensor, sound sensor/microphone, and magnets (to be read by the magnetic sensor). Function: When the user comes in range of the proximity sensor, Applyosaurus encourages them to study. The user says what kind of homework they need to do (problem-based vs. time-based); for problem mode, they use the touch sensor to tell Applyosaurus how many problems they need to do, then high-five the sensor after finishing each problem. When the user finishes their work, they can remove Applyosaurus from its base and go play! 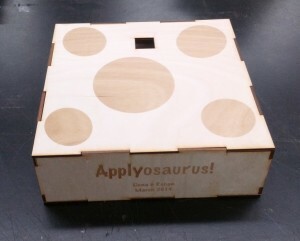 Components: Laser-cut and -etched plywood box containing a second Lego brick and the magnetic sensor. Function: Magnetic sensor detects signals from magnets in Applyosaurus’s tail. If Applyosaurus is removed from its dock before the problems are done, it protests noisily! Instead of being disassembled after the project was complete, Applyosaurus now lives in Georgia Tech’s Interactive Product Design Lab and has been featured in presentations and tours of the lab as a example of student work.